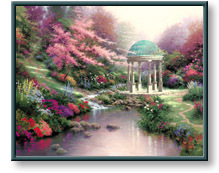 Pools of Serenity art prints and canvases by artist Thomas Kinkade for sale. "It may be that all of us carry in our souls a memory of Eden, the glorious garden where we came to know our Creator. That could account for the attraction I've long felt for gardens — resplendent in riotous colors and tranquil in their shadowy private spaces. Nanette and I take advantage of the romance of gardens to enrich our love. We've sought out their sheltered nooks to meet and talk and dream and remember. "Pools of Serenity, second in the Garden of Prayer collection, speaks to those personal associations and to something more profound. I've reached into the core of my spiritual life to express what I can only call the wonderfully comforting friendship I feel with my God. "This serene haven  a breathless, mirror bright pool reflecting an abundance of flowers, embraced by the shelter of a monumental stone gazebo — expresses the 'peace that passeth understanding' that rewards my communion with the divine. There is an air of breathless anticipation here and up on the distant hill, is that a gentle stranger who awaits?" Add $45 for shipping & handling. Add $75 for shipping & handling. Image Size: 32" x 40"
Add $95 for shipping & handling. Pools of Serenity copyright© 1999 by Thomas Kinkade is prohibited from being copied.